So I finally got to take my new Olympus OM-D EM-5 out onto the streets of Cardiff and shoot what I would normally have done on film, don’t worry I still took my trusty OM-1 and will have film shots from that day also. Below is a few examples of the photo’s taken, all with my EM-5 and using the M.Zuiko 17mm 1.8 lens. First up is this shop-front that looks to be going through the start of a refurbishment, I walked past the window as I entered one of the shopping arcades and the lone man caught my eye. 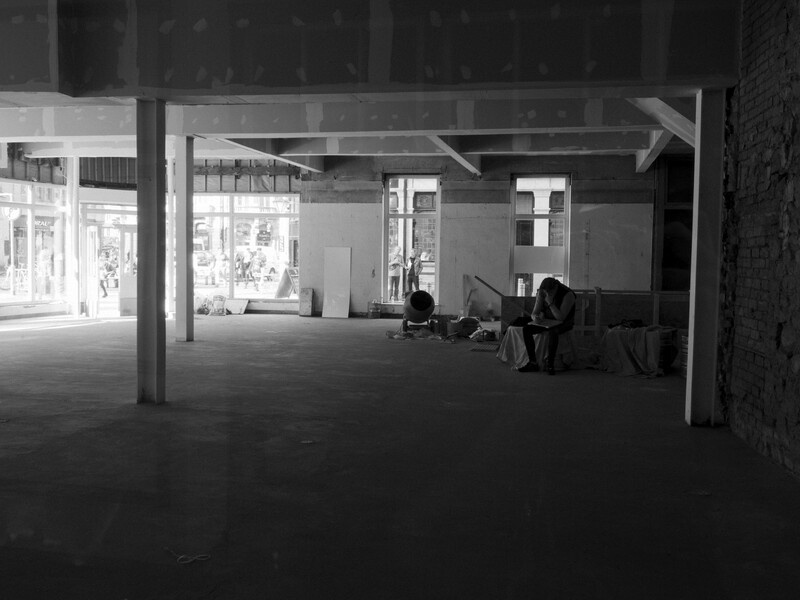 Sat in the shadows, on his own in the huge empty room with light pouring in to the other side and totally engrossed in whatever he’s reading in his lap. ISO 400, f8, 1/25th sec. 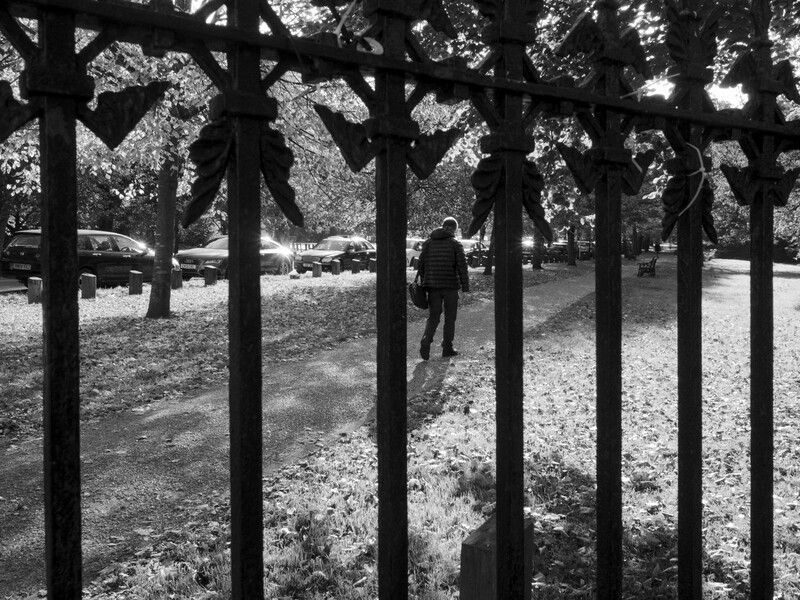 Next we have this man who was walking a path near the temporary bus station, I like how the railings and gap in the fence frame him in the shot. ISO 400, f8, 1/60th sec. Finally this is perhaps my favourite of the day as it, in my opinion, perfectly sums up what shooting in black and white is about. 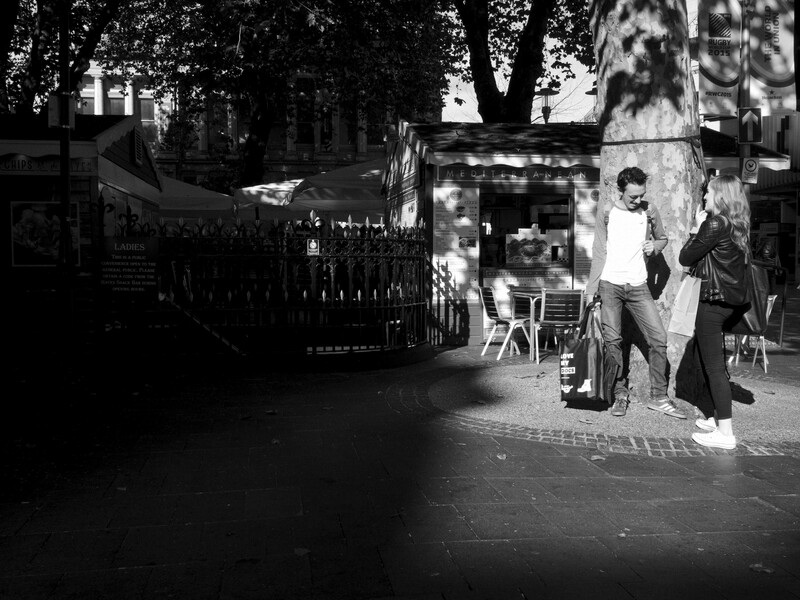 The absence of colour has made the shadows and light play a much more prominent role in this image, I think the couple standing in the bright light, illuminated and stood out against the shadows all around them perfectly encapsulates the emotion you think they are feeling, perhaps. ISO 400, f8, 1/250th sec. I have more and will be posting them as and when I can, I didn’t want to oversaturate this post with images as I feel that would take away from each of them. Anyway please feel free to tell me what you think about these? I’d welcome comments, questions or feedback below.